Send us a letter of support. Previously we have had letters of support from the Prime Minister, the Leader of the Opposition, and the other main political parties, Mayor of London Boris Johnson, Stuart Milk (nephew of Harvey Milk), Baroness Doreen Lawrence of Clarendon OBE, of Clarendon in the Commonwealth Realm of Jamaica. Write to your local Member of Parliament, your local Councillors, your local Police and Crime Commissioners, your local faith leaders and local community leaders! Are you a member of a Trade Union or a Political Party? Don’t forget to contact them too an ensure that they have pledges in place to tackle hate crime too! Promote the week using your social media profiles. 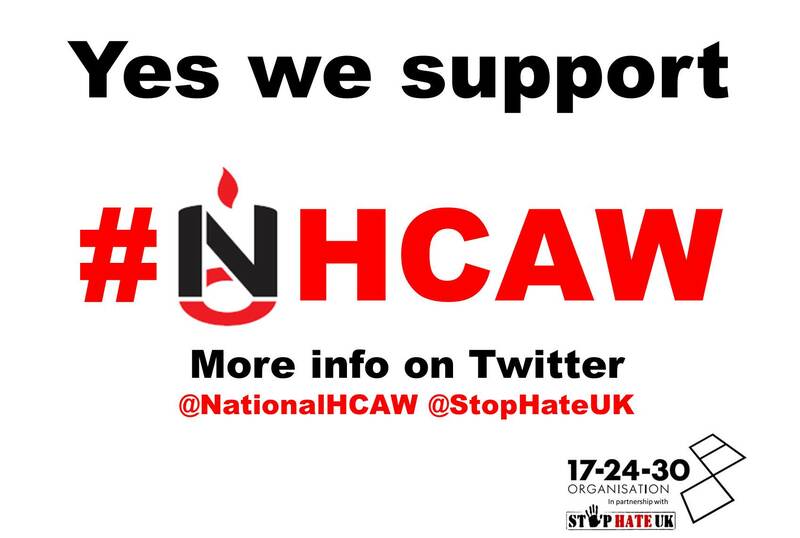 Use social media to promote local events and make sure your follow our twitter profiles too @NationalHCAW and @StopHateUk. Every tweet re-tweeted or favourited helps us reach a wider audience! Use the recommend hash tags #NHCAW, #NoPlaceForHate, #SafePlaceForAll, and #WeStandTogether. 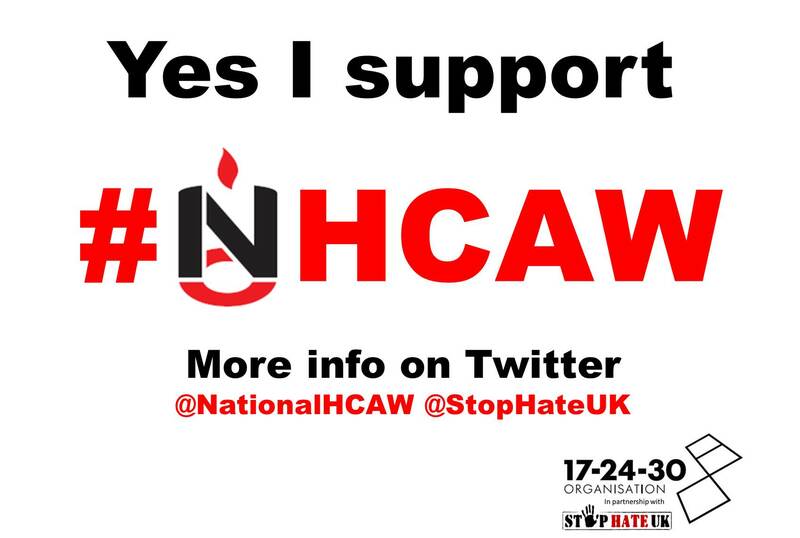 #HCAW may also be used. Make sure you Like and Follow us! Fund and support local hate crime initiatives. You may not have a pot of cash to support your local services but there is a lot you can do to promote and support them using your social media profiles. Ensure they are included when you are working with local communities. Contact them and request their resources – posters and leaflets that you can display in your schools, places of work, places of worship and other community venues. You could become a volunteer and help them with the work they are doing. And how about organising a fundraising event? Make sure they are listed in our Hate Crime Almanac! Hold your own hate crime awareness events (ideally collaborating with your local council, local police, local hate crime services and communities affected by hate crime). The main objective of these events is to raise public awareness of hate crime – make sure you know what the definition of hate crime is and who it affected. Remember those who have been killed or injured. Signpost and promote local services. Start the discussion about how people in your area can work together to support the Government’s goals (1) To prevent hate crime, (2) To encourage reporting and signpost advice and support services, (3) To improve operational response to hate crime incidents, and our goal which is to make everyone aware of hate crime and the need to eliminate all forms of hate in our communities. Make sure you are aware of local hate crime reporting arrangements and promote them – the more people who are aware of how to report hate crime – the more people are likely to report it. You can find out more about reporting hate crime on the True Vision website. Set up Facebook events pages to share information about what you are doing and register your events with us using the #NHCAW Event registration form below! Make sure you register your events with us! Download the #NHCAW banners and take a photo of yours and others with them to how your support and share them on your social network profiles – don’t forget to use the hash tag so we can see them too! Display hate crime posters to encourage people to report hate crime! You can ask your local hate crime services to supply you with their hate crime posters and then help them out by displaying them in your schools, work places, places of worship and community venues. Perhaps your local bar (if asked) will display one too! Order wrist bands, badges and t-shirts from us to show your support. Details will be added shortly. Details of how to order wrist bands, badges and T-shirts will be added shortly. Download our Hate Crime Awareness How to Guides. We are also developing hate crime awareness packs – details will be added once they are available! Last year in Lambeth the local disability groups set up a local Disability Hate Crime Working Group to organise an event to bring people together to have a conversation about Disability hate crime. The event was very successful and lead to the formation of theDisability Hate Crime Partnership Lambeth which meets regularly at We Are 336 in Brixton. The partnership is going from strength to strength, developing it’s own identity independent of Lambeth Council and inspiring local people to get involved. The partnership is lead by the Disability Advice Service Lambeth DASL and is currently applying for funds to set up a third party reporting centre. The London borough of Hounslow used the week to organise a meeting of local faith groups and leaders. This lead to the creation of the Hounslow Interfaith Hate Crime Forum which is doing some great work to tackle faith hate crime. 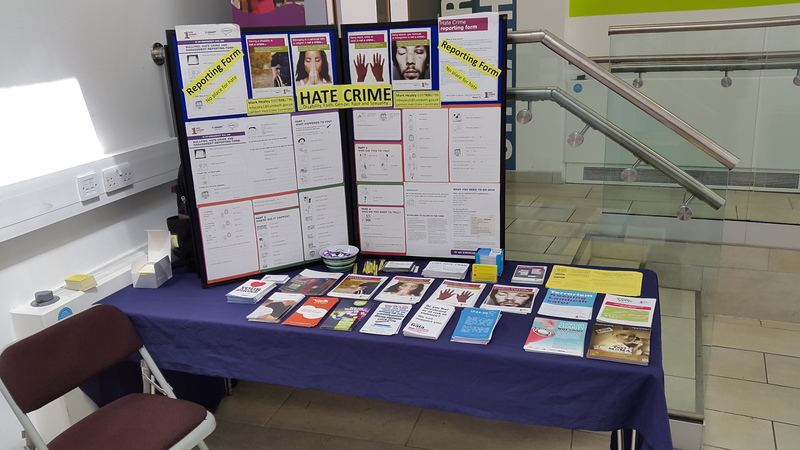 Hertfordshire County Council held a hate crime stall last year which gave them the confidence to put on their own Hate Crime Awareness Week last month. Back in Lambeth Mark has set up a Lambeth Hate crime Stall which he takes out on tours of Lambeth Libraries every four months. He is currently negotiating to have the stall on display in local places of worship and people organising other events in the borough can book him on line to bring the stall to their events. 17-24-30 and Fire nightclubfunded 25,000 hate crime reporting cards which have been distributed in the borough which has since seen increased levels of hate crime reporting across all of the hate crime strands. Closer to the National Hate Crime Awareness Week we will be posting a hate crime toolkit on both this and the Stop Hate UK websites. We are currently negotiating funding for a National Hate Crime Week poster that we hope to distribute to those interested by early September. “Whatever you do during National Hate Crime Awareness Week – do something – everything that helps raise the profile of the week helps those who have been affected by hate crime get closer to the advice and support they need.